The sensation he felt walking through the passage was disturbing. The expected tingling flowed through his body as the mysterious blue light glowed about him. He tensed his muscles, but, as before in the upper catacombs, there was no pain. Thomas couldn't help but wonder at the nature of this magic... 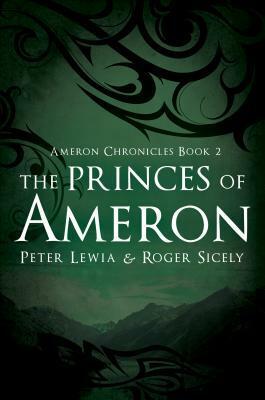 The epic adventure continues in The Princes of Ameron as Thomas fights to save his own life and the lives of strangers he has grown to cherish. Hank, his brother, struggles to keep the threads of darkness from his mind and to understand the awesome power laid at his feet...a power no man has the right to wield. Both men, blessed by the One and haunted by personal ghosts, strive to walk the path thrust before them...until a twist of fate allows them to choose another. In the sequel to The Heir of Ameron, the kingdom of Ameron falls deeper into the clutches of the evil Shanta Raau whose cryptic intentions and brutally dark armies leave an entire nation reeling in chaos. The two brothers, both with the only legitimate claims to the throne, are expected to deliver the realm from spiraling into the pit of darkness. Unfortunately, neither brother has any desire to wear the crown. One will have no choice. Book 2! I'm so glad that I went back and bought the other 4 books in this series. Book 2 had me reading every single chance that I got. The plot has just enough twists and turns that I feel as if I'm learning things right alongside the characters. The series is quickly becoming a history lesson within what's currently happening within the kingdom. The characters are starting to discover who they are and their roles. The Christian themes were stronger within this book but even if you don't share those beliefs, it shouldn't take you outside of the story. Honestly, I can't get enough of this series. If you'd like to check it out, contact the authors via their Facebook page. Unfortunately, I think that direct from author is the only way to get your fingers on this series. It's my hopes that once the drama with their publisher is resolved, they'll have the rights to these books and will re-issue them. These could do very well. I'll be keeping my eyes open for a website or further information for sure!